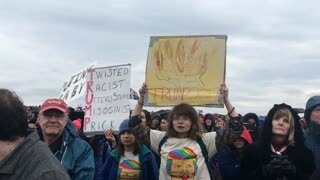 Search Results for "donald trump inauguration"
Demonstrators chant at entry checkpoint for Trump Inauguration; Trump is Putin's Puppet chant, placards denouncing EPA nominee Pruitt, at Washington Monument grounds entry to Donald Trump's Inauguration. Crowds watch Donald Trump's inauguration as president of the United States. Patriotic crowds watch Donald Trump's inauguration as president of the United States. A woman offers a flower to police in riot gear at the inauguration of Donald Trump in Washington DC. WASHINGTON, Jan. 20, 2017 -- Police in riot gear with batons and helmets form a line surrounding detained #DisruptJ20 protesters during the presidential inauguration of Donald Trump. WASHINGTON, Jan. 20, 2017 -- Police attack detained #DisruptJ20 protesters with stingball grenades and chemical weapons (CS gas and pepper spray) during the presidential inauguration of Donald Trump. America January 2017 - Riot police defend themselves with shields when rocks are thrown at them during protests against the inauguration of president Donald Trump, Washington DC. America January 2017 - Riot police defend with shields and aim a rubber bullet gun when rocks are thrown at them during protests against the inauguration of president Donald Trump, Washington DC. America January 2017 - A veteran finishes a salute at the end of the national anthem during an inauguration concert for Donald Trump, Washington DC. America January 2017 - A veteran salutes a giant television screen while the national anthem plays during an inauguration concert for Donald Trump, Washington DC. Mounted Park Police line up, ready for action. Trained for crowd control, they also patrol Federal Parks; here in Washington on Inauguration Day of Donald Trump. America January 2017 - Riot police in helmets nervously stand in line on protests against the inauguration of president Donald Trump, Washington DC. America January 2017 - Riot police with shields and batons march forwards and throw a flash-bang grenade during protests against the inauguration of president Donald Trump, Washington DC. 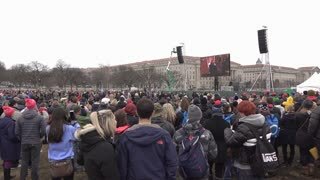 America January 2017 - People use smart phones to film Donald Trump on a giant television screen during his inauguration concert at Lincoln Memorial, Washington DC. Donald Trump's presidential motorcade moves through Washington DC during the Inauguration. A vendor sells Donald Trump posters and flags from a cart during the Inauguration in Washington DC. Donald Trump supporters with Make America Great Again hats pose for the camera at the Inauguration. Donald Trump supporters with Make America Great Again hats pose for the camera at the Inauguration in Washington DC. Violence erupts at Donald Trump's inauguration in Washington D.C.
A vehicle window is shattered as violence erupts at Donald Trump's inauguration in Washington D.C.